As sea kayakers forward paddling is the most important stroke that we have in our repertoire but possibly the one that we practice the least, once we reach a certain skill level. Something that we rarely think about is cadence, the rate at which we perform the stroke. This weekend I have spent a very enjoyable two days with members of Portsmouth Canoe Club, paddling in Swanage Bay. We conducted a number of 5 minute time trials recording the number of strokes performed on the right hand side of the kayak, there were 16 of us in the group and over half of the paddlers were within 10 strokes of each other. This is an exercise, which I have conducted in many areas of the world with a large number of paddlers of all abilities, for nealy 30 years, and from the results I would suggest that an appropriate paddling rate is between 135 and 145 right hand paddle strokes every five minutes. This would appear to be suitable for paddlers of all sizes and abilities, all paddle lengths and types and weather and sea conditions. There is no scientific evidence for this number but it seems to work. For most paddlers it results in an appropriate forward paddling speed. Try it when you are out on the water and see what figures you come up with, as an exercise it also helps to pass the time whilst on open crossings.Remember that if you have an effective forward paddling rate of 145 right hand strokes every 5 minutes this translates into 10,440 strokes on a six hour day trip, whereas if you have a rate of 180 strokes in the same six hour period you will end up doing 12,960 strokes. Over 2,500 more strokes, which on a two week trip translates to an extra 35,000 strokes hence the need to develop an efficient technique. These are my thoughts and observations but comments would be welcome. There are plenty of other ideas regarding forward paddling plus a variety of other strokes available in my e-book The A – Z of Sea Kayaking, which is available from Amazon. John Crosby leaving Polyageos for Folegandros. A crossing of nearly 12 nautical miles in the . An effecient forward paddling stroke is essential when paddling in waters like these day after day. Pete Hargreaves en route to Sark with a reasonable westerly swell. Sark is just visible in the top left. A fluent forward paddling style is required on such crossings. 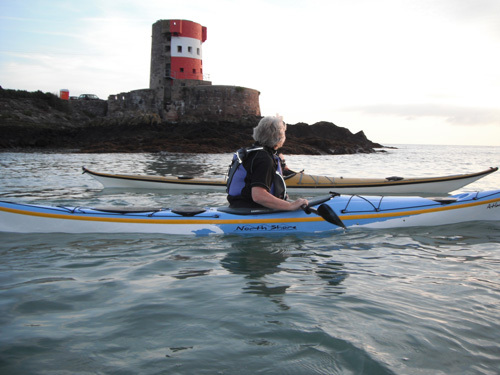 One of the more unusual characteristics of sea kayaking around the Jersey coastline are the significant numbers of Jersey Round Towers, which punctuate the coast at regular intervals. 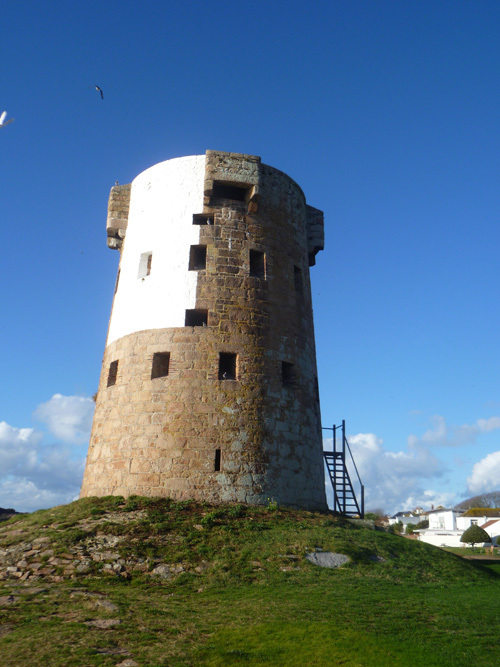 In 1781 a French force under the command of Baron de Rullecourt, landed at La Rocque, the south east corner of the island and marched as far as St Helier before being defeated in the Battle of Jersey, in the Royal Square. This was too close to French success for the authorities so they embarked on a programme of building coastal towers around the island. 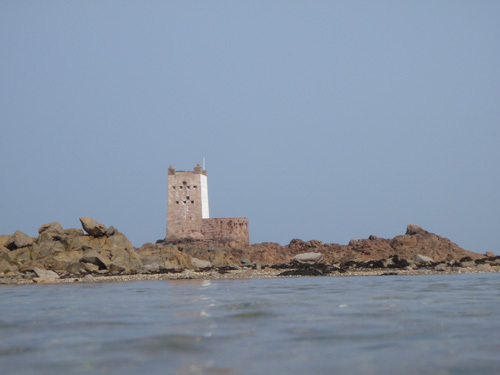 Many of these towers survive and provide a historic backdrop to sea kayaking in Jersey’s coastal waters. Seymour Tower, built in 1782, was the first tower to be built following the French invasion. In complete contrast to all the other Jersey Round towers it is square in shape. Built approximately 1 mile offshore it is a fascinating paddle when the tide is in, or walk on low water springs when the shore dries. Nicky paddling out of Archirondel early one morning. We were actually on a photo shoot for Jersey tourism, who were keen to publicize the sea kayaking opportunities in Jersey . Our only venture into the world of modeling. The tower was completed in 1794 and in common with so many other towers around the island is now painted as a navigation mark. The south east corner of the island with its shallow waters, sandy beaches and shelter from the prevailing wind was the favoured location for another French invasion. Built in the 1780’s it was one of many which helped to protect this section of coastline. In all 23 towers were built by Sir Henry Seymour Conway, who was Governor of the Island. Not all of the towers have survived the passage of time. At L’Etacq a tower was blown up during the German occupation of the Second World War to make way for a bunker, which is now used by a local fisheries company. 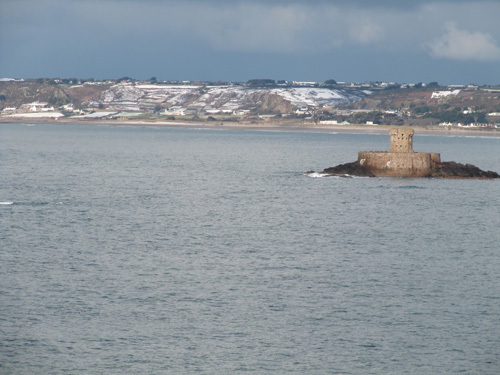 Built offshore, in St Ouen’s Bay, La Rocco Tower is probably the most photographed of all the Jersey Towers and the last of Conway’s Towers to be built. 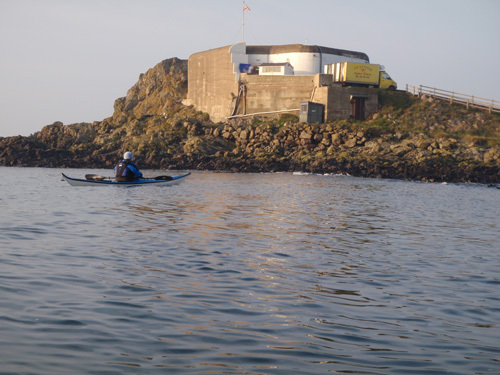 When paddling around Jersey I generally leave from Corbiere, to gain maximum benefit from the tide and La Rocco is a welcome sight as it is less than a mile from the finish, with over 28 nautical miles already under your belt. A great feeling. The last Invasion of the British Isles? As regular readers will know my favourite sea kayaking trip is to the Ecrehous, a delightful reef to the north east of Jersey. Last weekend we were fortunate enough to visit the islands on the large spring tide and had access to one of the huts for the evening. Reading through an old visitors book there was a recording of the events which unfolded during what is possibly the “last invasion of the British Isles”. In 1993 a group of French fishermen landed on the reef and pulled down the Union Flag, which flies when people are in residence on the reef. It flies over the southern end of La Marmotiere. Information was received that in 1994 a large “invasion” was planned but this time the Jersey police were ready to protect the sovereignty of the reef. The events of the day are recorded in the visitors book by the Police officers who were on the reef. Police HQ, 24, States of Jersey Police Officers and St Martins Honorary Police landed at 06.00 in response to threat from French fishermen of a mass planned demonstration by extension of Jersey territorial waters. 09.30 hrs first boat with demonstrators arrived. 10.30 hrs 6 large fishing boats arrived with 100 demonstrators including 12 right wing activists. 11.30 mass with French Priest held on the stone beach, demonstration urged to take action to lay claim to Les Ecrehous. 13.00 fight between two fishermen at the official flag pole was dealt with by Police. Reinforcements – further 12 officers shipped in. A very welcome sight – a calming influence to see the Duchess and two rigid raiders. All demonstrators left on good terms with the community and Police Scene Commander Supt Jones ordered stand down at 19.00. Two officers left on the island overnight. The Ecrehous as they should be seen, peaceful with clear waters and interesting tidal flows. It is easy to see why some French would want to take over the sovereignty of the Ecrehous but the International Court of Justice ruled in favour of Jersey on the 17th November 1953. It would be interesting to find out if there has been a more recent “invasion” of the British Isles.